The river originates from several tributaries in the eastern part of the Tibetan Plateau, two of which are commonly referred to as the "source". Traditionally, the Chinese government has recognized the source as the Tuotuo tributary at the base of a glacier lying on the west of Geladandong Mountain in the Tanggula Mountains. This source is found at 33°25′44″N 91°10′57″E﻿ / ﻿33.42889°N 91.18250°E and while not the furthest source of the Yangtze, it is the highest source at 5,342 m (17,526 ft) above sea level. The true source of the Yangtze, hydrologically the longest river distance from the sea, is at Jari Hill at the head of the Dam Qu tributary, approximately 325 km (202 mi) southeast of Geladandong. This source was only discovered in the late 20th century and lies in wetlands at 32°36′14″N 94°30′44″E﻿ / ﻿32.60389°N 94.51222°E and 5,170 m (16,960 ft) above sea level just southeast of Chadan Township in Zadoi County, Yushu Prefecture, Qinghai. As the historical spiritual source of the Yangtze, the Geladandong source is still commonly referred to as the source of the Yangtze since the discovery of the Jari Hill source. The origin of the Yangtze River has been dated by some geologists to about 45 million years ago in the Eocene, but this dating has been disputed.. The Yangtze flows into the East China Sea and was navigable by ocean-going vessels up 1,000 miles (1,600 km) from its mouth even before the Three Gorges Dam was built. As of June 2003, this dam spans the river, flooding Fengjie, the first of a number of towns affected by the massive flood control and power generation project. This is the largest comprehensive irrigation project in the world and has a significant impact on China's agriculture. Its proponents argue that it will free people living along the river from floods that have repeatedly threatened them in the past and will offer them electricity and water transport—though at the expense of permanently flooding many existing towns (including numerous ancient cultural relics) and causing large-scale changes in the local ecology. As of 2011, 416 fish species are known from the Yangtze basin, including 362 that strictly are freshwater species. The remaining are also known from salt or brackish waters, such as the river's estuary or the East China Sea. This makes it one of the most species rich rivers in Asia and by far the most species rich in China (in comparison, the Pearl River has almost 300 fish species and the Yellow River 150). 178 fish species are endemic to the Yangtze River Basin. Many are only found in some section of the river basin and especially the upper reach (above Yichang, but below the headwaters in the Qinghai-Tibet Plateau) is rich with 279 species, including 147 Yangtze endemics and 97 strict endemics (found only in this part of the basin). In contrast, the headwaters, where the average altitude is above 4,500 m (14,800 ft), are only home to 14 highly specialized species, but 8 of these are endemic to the river. The largest orders in the Yangtze are Cypriniformes (280 species, including 150 endemics), Siluriformes (40 species, including 20 endemics), Perciformes (50 species, including 4 endemics), Tetraodontiformes (12 species, including 1 endemic) and Osmeriformes (8 species, including 1 endemic). No other order has more than four species in the river and one endemic. ^ a b George, Jamieson (1911). "Yangtsze-Kiang" . In Chisholm, Hugh. Encyclopædia Britannica. 28 (11th ed.). Cambridge University Press. p. 903. ^ An, Min (安民) (23 January 2010). 《夜晤扬子津》 [Yangtze Ferry]. yznews.com.cn (in Chinese). The baiji (Chinese: 白鱀豚; pinyin: báijìtún , Lipotes vexillifer, Lipotes meaning "left behind", vexillifer "flag bearer") is a functionally extinct species of freshwater dolphin formerly found only in the Yangtze River in China. Nicknamed "Goddess of the Yangtze" (simplified Chinese: 长江女神; traditional Chinese: 長江女神; pinyin: Cháng Jiāng nǚshén) in China, the dolphin is also called Chinese river dolphin, Yangtze River dolphin, whitefin dolphin and Yangtze dolphin. It was regarded as the goddess of protection by local fishermen and boatmen in China (Zhou, 1991). It is not to be confused with the Chinese white dolphin or the finless porpoise. Swiss economist and CEO of the baiji.org Foundation August Pfluger funded an expedition in which an international team, taken in part from the National Oceanic and Atmospheric Administration and the Fisheries Research Agency in Japan, searched for six weeks for signs of the dolphin. The search took place almost a decade after the last exploration in 1997, which turned up only 13 of the cetaceans.In August 2007, a Chinese man reportedly videotaped a large white animal swimming in the Yangtze. Although it was tentatively confirmed that the animal on the video is probably a baiji, the presence of only one or a few animals, particularly of advanced age, is not enough to save a functionally extinct species from true extinction. The last known living baiji was Qiqi (淇淇), who died in 2002. The World Wildlife Fund is calling for the preservation of any possible baiji habitat, in case the species is located and can be revived.A related creature from the Neogene is Parapontoporia. The Han River, also known by its Chinese names Hanshui and Han Jiang, is a left tributary of the Yangtze in central China. It has a length of 1,532 kilometers (952 mi) and is the longest tributary of the Yangtze system. The river gave its name to the Han dynasty and, through it, to the Han Chinese, the dominant ethnicity in China and the most populous ethnic group in the world. It is also the namesake of the city of Hanzhong on its upper course. Hankou (Chinese: t 漢口, s 汉口, p Hànkǒu), formerly romanized as Hankow (Hangkow), was one of the three towns (the other two were Wuchang and Hanyang) whose merging formed modern-day Wuhan city, the capital of the Hubei province, China. It stands north of the Han and Yangtze Rivers where the Han flows into the Yangtze. 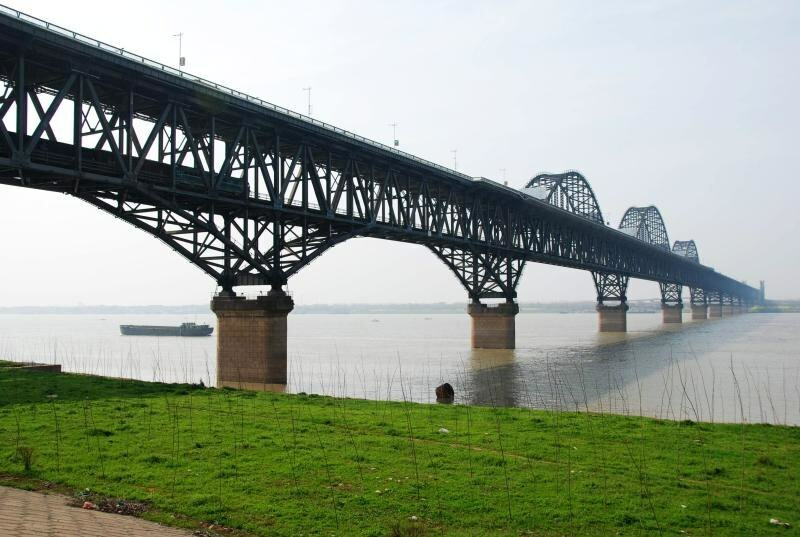 Hankou is connected by bridges to its triplet sister towns Hanyang (between Han and Yangtze) and Wuchang (on the south side of the Yangtze). Hankou is the main port of Hubei province and the single largest port in the middle reaches of Yangtze. The Nanjing Yangtze River Bridge (Chinese: 南京长江大桥; pinyin: Nánjīng Chángjiāng Dàqiáo) is a double-decked road-rail truss bridge across the Yangtze River between Pukou and Xiaguan in Nanjing, China. Its upper deck is part of China National Highway 104, spanning 4,588 metres (15,052 ft). Its lower deck, with a double-track railway, is 6,772 metres (22,218 ft) long, and completes the Beijing-Shanghai Railway, which had been divided by the Yangtze for decades. Its right bridge consists of nine piers, with the maximum span of 160 metres (525 ft) and the total length of 1,576 metres (5,171 ft). The bridge carries approximately 80,000 vehicles and 190 trains per day. The Port of Shanghai (Chinese: 上海港; pinyin: Shànghǎi Gǎng; Wu: Zaanhe Kaon), located in the vicinity of Shanghai, comprises a deep-sea port and a river port. In 2010, Shanghai port overtook the Port of Singapore to become the world's busiest container port. Shanghai's port handled 29.05 million TEUs, whereas Singapore's was a half million TEU's behind.In 2016, Shanghai port set a historic record by handling over 37 million TEUs. Suparna Airlines, known in Chinese as Jinpeng (Chinese: 金鹏航空; pinyin: Jīnpéng Hángkōng), is an airline based in China. It was formerly known as Yangtze River Express and later Yangtze River Airlines after launching passenger services. The company's headquarters are in "Shanghai Pudong Development Bank Tower" (Chinese: 浦发大厦; pinyin: Pǔ fā dà shà) in Pudong, Shanghai. The Three Gorges Dam is a hydroelectric gravity dam that spans the Yangtze River by the town of Sandouping, in Yiling District, Yichang, Hubei province, China. The Three Gorges Dam has been the world's largest power station in terms of installed capacity (22,500 MW) since 2012. In 2014, the dam generated 98.8 terawatt-hours (TWh) and had the world record, but was surpassed by the Itaipú Dam, which set the new world record in 2016, producing 103.1 TWh.Except for the locks, the dam project was completed and fully functional as of July 4, 2012, when the last of the main water turbines in the underground plant began production. The ship lift was complete in December 2015. Each main water turbine has a capacity of 700 MW. The dam body was completed in 2006. Coupling the dam's 32 main turbines with two smaller generators (50 MW each) to power the plant itself, the total electric generating capacity of the dam is 22,500 MW.As well as producing electricity, the dam is intended to increase the Yangtze River's shipping capacity and reduce the potential for floods downstream by providing flood storage space. China regards the project as monumental as well as a success socially and economically, with the design of state-of-the-art large turbines, and a move toward limiting greenhouse gas emissions. However, the dam flooded archaeological and cultural sites, displaced some 1.3 million people, and had caused significant ecological changes including an increased risk of landslides. The dam has been controversial both domestically and abroad. The Yangtze Patrol, also known as the Yangtze River Patrol Force, Yangtze River Patrol, YangPat and ComYangPat was a prolonged naval operation from 1854–1949 to protect American interests in the Yangtze River's treaty ports. The Yangtze Patrol also patrolled the coastal waters of China where they protected U.S. citizens, their property, and Christian missionaries. The Yangtze River is the longest river in China and it plays an important commercial role, with ocean-bound vessels proceeding as far upstream as the city of Wuhan. This squadron-sized unit cruised the waters of the Yangtze from Shanghai on the Pacific Ocean into the far interior of China at Chungking.Initially, the Yangtze Patrol was formed from ships of the United States Navy and assigned to the East India Squadron. In 1868, patrol duties were carried out by the Asiatic Squadron of the United States Navy. Under the unequal treaties, the United States, Japan, and various European powers, especially the United Kingdom, which had been on the Yangtze since 1897, were allowed to cruise China's rivers. In 1902, the United States Asiatic Fleet took control of the operations of the Yangtze Patrol. In 1922, Yangtze Patrol was established as a formal component of the United States Navy in China. In 1942, at the beginning of World War II, the Yangtze Patrol effectively ceased operations in China because of the limited resources of the United States Navy, which needed the patrol crews and their ships elsewhere in fighting Japanese forces throughout the Pacific. Following the end of World War II, the Yangtze Patrol resumed its duties in 1945, but on a more limited basis with fewer ships during the Chinese Civil War. When the Chinese Communist forces eventually occupied the Yangtze River valley in 1949, the United States Navy permanently ceased operations and disbanded the Yangtze Patrol. The Yangtze River Crossing Campaign (Chinese: 渡江战役) was a military campaign launched by the People's Liberation Army to cross the Yangtze River and capture Nanjing, the capital of the Nationalist government of the Kuomintang, in the final stage of the Chinese Civil War. The campaign began at night on 20 April, and lasted until 2 June 1949, concluding after the fall of Nanjing and Shanghai to the Communist forces. The Yangtze River passageway is a proposed high-speed railway passage in China. It will run in an east-west direction largely parallel to the Yangtze River, connecting the cities of Shanghai, Nanjing, Hefei, Wuhan, Chongqing and Chengdu. Announced in 2016 as part of the national "eight vertical and eight horizontal" high-speed railway network, the passage will comprise multiple railway lines and branch lines, including those currently operational as well as those under construction and under planning. The Yangtze River power line crossings are overhead power lines that cross the Yangtze River in China. There are at least three power line crossings on the Yangtze River at Jiangyin, Nanjing, and Wuhu. The towers of the crossing in Jiangyin are among the highest in the world. The Yangtze giant softshell turtle (Rafetus swinhoei; simplified Chinese: 斑鳖; traditional Chinese: 斑鱉; pinyin: bānbiē), also known as the Red River giant softshell turtle, the Shanghai softshell turtle, the speckled softshell turtle, and Swinhoe's softshell turtle, is an extremely rare species of turtle in the family Trionychidae. The species is endemic to eastern and southern China and northern Vietnam. Only four living individuals are known, one in China (captive) and three in Vietnam (wild) (a fifth wild individual from Vietnam having been reported dead in January 2016), and it is listed as critically endangered in the IUCN Red List. It may be the largest living freshwater turtle in the world. The female of the last breeding pair died at Suzhou Zoo in China in April 2019, making the species functionally extinct unless a wild female is found.